01:29 Lisette gives us a very quick update of what she's up to. 02:22 Pilar gives us a longer update, talking about the UCExpo she visited in Olympia, London. (Unified Communications and Collaboration Event) Marianne Calder, CISCO. "Value, People, Process." We've maximised individual productivity and now we're onto maximising team productivity. We talk about an article in the Wall Street Journal "This Startup's Bold Experiment Failed and They're a Better Company for It". "'Collaboration' does not mean using a collaboration tool." 18:50 Kahootz, a company providing online workspaces, working mainly with the UK's public bodies. The UK's government approach to cloud security. 23:10 Becoming a digital citizen in Estonia. "Life in a networked society." Lisette refers to this video, it's embedded below. 25:30 We finally come to the topic of Working Globally and Culture. A definition of "culture". 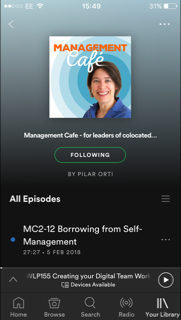 Pilar refers back again to Yael Zofi's A Manager's Guide to Virtual Teams. Culture: "The shared mental programmes that condition individual's responses to their environment." 33:34 Off-shoring and near-shoring. Do we need different strategies to deal with people from countries near to us and those very far away from us? 37:47 Breaking down the differences between us as people, and differences between cultures. 42:08 The "us" vs "them" mentality. 53:10 How to introduce changes without it looking like you're imposing from the top down and other "pro tips" from Lisette.